What is Judgment in the Christian sense? 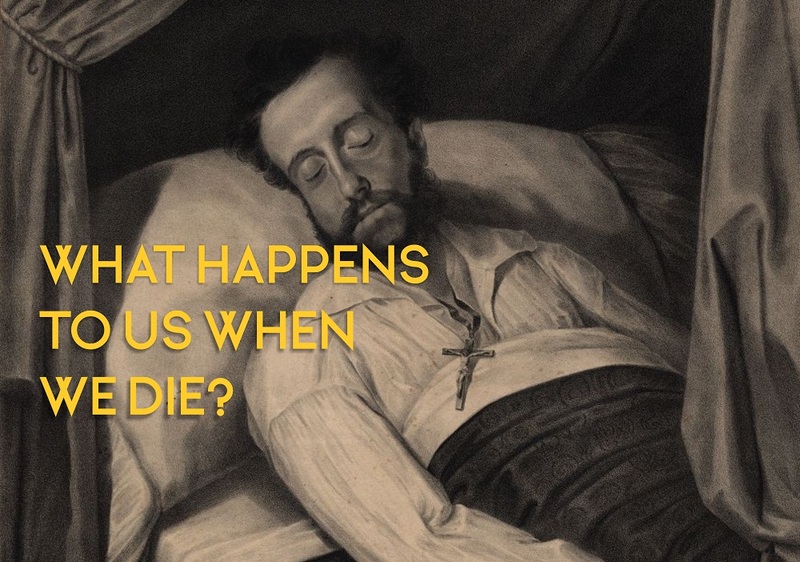 As we saw in the last session, “death puts an end to human life as a time open to either accepting or rejecting the divine grace manifested in Christ.” (CCC 1021) So the opportunity to repent is now over. God’s mercy and compassion is expressed in giving us a life in which to use our freedom of will either to be for Him or against Him. God the Father has bestowed on us, through His Son, many opportunities to cooperate with grace. The more we have been offered, the more is expected of us. Judgment is then the application of truth and justice. There are two sorts of judgment that occur. One occurs before Christ comes again at the end of time, and the other occurs following His second coming (known as the “parousia” – see diagram above). One form of judgment is applied individually to a person’s life, the other is applied collectively. General Judgment (Last Judgment) – this occurs after the second coming of Christ and will be dealt with in a later session on the Parousia. It is not judgment of an individual but in a way a corporate judgment. Particular Judgment is made by Christ upon our lives. It is the coming of divine truth to the way we have spent the gift of our lives. The concept of being held to account for our moral decisions can seem to some modern ears as a harsh thing! But divine judgment is not the arbitrary whim of a powerful being who somehow enjoys inflicting punishments. Holy Scripture tells us that God desires all men to be saved. God judges us while desiring all to be saved but also honouring the fact that He has created us all in His image with freedom of will. It is the consequence of our freedom of will that has made us culpable for our sins. God has given us baptism to free us from the consequences of sin (original & personal). God has given us grace to be able to resist temptation. God has revealed to us in Scripture and Tradition what sin is and how serious it is. But as free beings we have the capability of going against His revelation and grace, and going our own way and sinning. There are always consequences to our sin. It is never purely just between us and God. Sin affects everything (just as charity affects everything). These consequences of our sin we and others can experience in this life as suffering. Judgment is about the reality of these consequences being fully revealed. The apostles said, Who then can be saved? In Christ, the Father has given us, His children, in our weakness, the ability to be forgiven and healed in Christ’s Church. As you listen to the gospels, do you not notice how often our Lord says to someone, “Your sins are forgiven”? He says this often even when He is healing a physical ailment. It is His divine Mission to rescue us from the consequences of choosing to sin because without His rescue we are doomed. 7. Prayer – maintaining closeness to God and trusting in His Promises. It is possible that by this way we can be released from all the consequences of our sins no matter what the sins are. 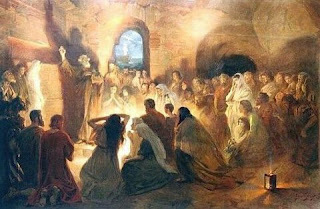 We can this way not only avoid hell, but it is possible to avoid purgatory as well. This gift of our redemption by Christ on the Cross should be something that always amazes us and causes us to rejoice. 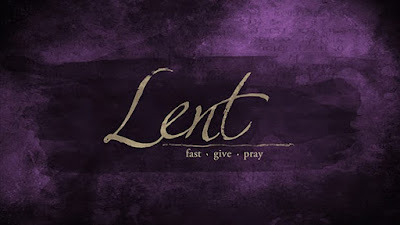 This tremendous gift of being able to be reconciled with God and being able to do penance now for our sins is one we should never take for granted nor neglect. How tragic it would be to come to our particular judgment with sins that we could have had absolved but for no good reason we didn’t go to confession? This is why the Church requires all its members (who can physically do so) to go to confession at minimum once a year. She makes it a Precept of our life of grace out of love for us! There are only two possibilities for eternity - they are called heaven and hell. It is either the blessedness of heaven or the damnation of hell. It is either to be with God for eternity or separated from Him for eternity. 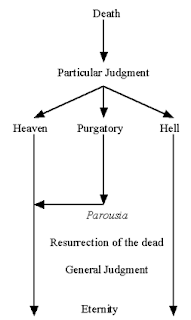 We may temporarily be held back from Heaven for a time of purification (known as Purgatory), but every soul in Purgatory will come to Heaven sooner or later before the parousia.